The Rouge of the North is the story of Yindi, a beautiful young bride who marries the blind, bedridden son of a rich and noble family. Captive to household ritual, to the strategies and contempt of her sisters-in-law, and to the exacting dictates of her husband's mother, Yindi is pressed beneath the weight of an existence that offers no hope of change. Dramatic events in the outside world fail to make their way into this insular society. 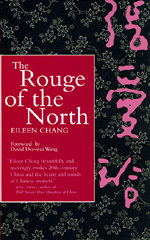 Chang's brilliant portrayal of the slow suffocation of passion, moral strength, and physical vitality—together with her masterful evocation of the sights, smells, and sounds of daily existence—make The Rouge of the North a remarkable chronicle of a vanished way of life.